Melbourne's Caulfield Racecourse, home of the Caulfield Cup. 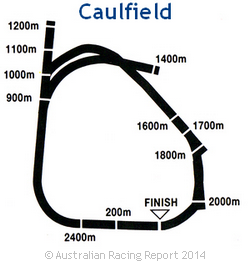 Our unofficial guide to Caulfield racetrack to help you win more at the Caulfield races. Caulfield Racecourse map, barrier positions, track bias indicators. Free Caulfield Cup Carnival info. Location: inner east, approx. 13kms from Melbourne CBD. 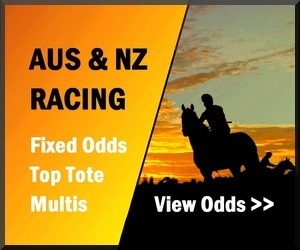 Feature Races: The Caulfield Cup is a Group 1 handicap held over 2400 metres in mid-October. The highlight of Caulfield's Cup Carnival with prize money of $2.5 million, regarded as one of the best lead up form races for the Melbourne Cup, but also stands out as one of the finest 2400m handicap races in the world. Other quality feature races throughout the year at Caulfield include the Caulfield Guineas, Blue Diamond, Blue Sapphire, Underwood & Toorak Hcp. The Course: Caulfield is a large course with a long straight run before the home turn, the home straight is 367 metres. A fair course which affords most runners an even chance when the rail is True, when the rail is out 6 metres or more it favours the on pace runners and leaders. The winning post is positioned in front of the mounting yard and is overlooked by an enclosed glass grandstand that ensures most spectators have a good view of the finish. 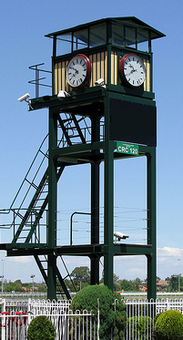 The clockers' tower is a notable feature at this course, situated in front of the grandstand, in the paddock adjoining the mounting yard. Home of the Blue Diamond Stakes, the Caulfield Guineas & the Caulfield Cup. 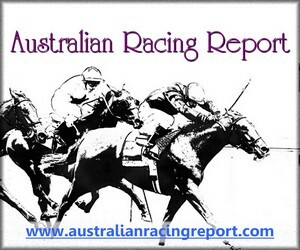 Caulfield Spring & Autumn Feature Racing Carnivals. What to wear at Caulfield. Members Dress Code at Caulfield is a suit, sports coat or blazer with a tie for men, from 1st November to Easter Cup Day jackets may be removed. Ladies are asked to maintain a 'suitable and appropriate' standard of dress. When attending the Caulfield Cup Carnival, many racegoers dress to this code even if they are not in the Members Reserve. Feature racing at Caulfield includes the Blue Diamond Stakes in February, the Memsie Stakes in August and the Underwood Stakes in September. The highlight of the racing year at Caulfield is the three day Caulfield Cup Carnival in October. Scheduled three weeks before the Victoria Derby meeting at Flemington racecourse which heralds the beginning of Melbourne Cup Week, the Caulfield Guineas launches the Caulfield Cup Carnival. Held on Saturday, racing on Caulfield Guineas day includes the Caulfield Stakes, Thousand Guineas, Toorak Handicap, Schillachi Stakes and Herbert Power Stakes. The following Wednesday is Ladies Day at Caulfield with the running of the Blue Sapphire Stakes, Debutants Stakes and the Ladies Day Vase. On the following Saturday the Caulfield Cup is run and won. Racing on Caulfield Cup day also includes the Caulfield Sprint, Tristarc Stakes and the Norman Robinson. After racing at Caulfield, attention turns to Moonee Valley and the Cox Plate, ahead of four big days of racing at Flemington racecourse for Melbourne Cup week. This makes October and November one very long racing party in Melbourne. All three days of the Caulfield Cup Carnival are popular with racegoers, tickets are available to purchase at the course or online at ticketek.com.au. With a Sportsbet account you can bet on the Melbourne Racing Carnival 24/7 so no matter where you are, you'll never miss a bet. 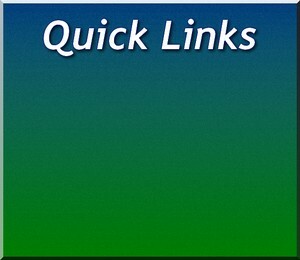 Join here and you could qualify for an exclusive Bonus Bet offer. 2000m – This start is just past the winning post in a small chute off the course proper. When the rail is True barriers are of little importance and most runners will have their chance. When the rail is out 5m or more there is an advantage to racing on the pace although it will be possible to make ground over the concluding stages if the pace has been keen up front. 2400m – Located at the top of the home straight, runners complete a full circuit of the course which usually gives everyone a chance when the rail is True. However, when the rail is out it’s if often hard to make up ground on the leading division and there is a distinct advantage to being drawn inside barrier 10. The Caulfield Cup – Over the 2400m and on the third day of racing at this track in a week the rail is usually out 4 – 6m or more. The maximum number of runners in the Caulfield Cup is 18 with 4 emergencies. Ideal barriers are 3 – 10. Since the 1980’s only a handful of runners have won the Caulfield Cup starting from outside barrier 9. There is usually plenty of pace from the front runners, top weights starting from an inside gate can get too far back and struggle to make ground. The Caulfield Cup is a tough handicap event and the pace is strong throughout. On pace runners can manage to fall into a place, but the winner is usually a quality stayer who can run out the trip by finding something extra in the closing stages. 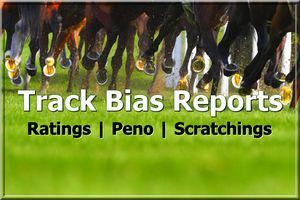 See the Melbourne Track Bias Report for more information on this weeks racing at Caulfield including official track conditions, scratchings & weather. About the track: Circumference is 2080m, length of the home straight is 367m. The grass is kept long and lush at this track, the going is usually on the softer side of Good and suitable for most runners. After heavy rain, the conditions can become very sticky and runners will usually avoid the ground near the inside fence, particularly when the rail is out 3m or more. In sprint races, regardless of whether the rail is in the normal True position or moved out, we often see an advantage those runners who are drawn in and can race on the pace. When the rail is out, the winners will be those in the leading division. 1000m & 1100m – Located in a chute off the course proper on the side of the track. There is a long straight run to the home turn. Inside barriers have a slight advantage. 1200m – Similar to the 1000m & 1100m starts at the end of the chute. Barriers of little importance. 1400m - Starting from a short branch at the back of the course, this start forces runners into a turn after just 150m, runners who have gained a forward position before the 1200m have an advantage. For this reason, an inside gate is preferred, particularly when the rail has been moved out 5m or more. 1600m – Inside barriers have an advantage here with a short run of just 200m to the first bend and a long curved run to the 850m mark. 1800m – Located in the back section of the course with a run of 400m to the first turn, barriers are usually of little importance. History: First Caulfield Cup run was run in the autumn of 1879, and moved to the spring in 1881. During the war years the track was closed and used as an army camp, with the Caulfield Cup being run at Flemington. Modern renovations to the track and the enclosed grandstand have made it one of the premier racecourses in Australia with top class facilities for the horses, club members and the public. Each raceday in the Melbourne Spring Racing Carnival has an official flower, for the Caulfield Cup it is a White Rose. Caulfield Cup Statistics: Fastest time recorded - Diatribe 2000 in 2:25.3. 11 horses have won the Caulfield Cup - Melbourne Cup double, the last being the New Zealand mare Ethereal in 2001. Favourites have a good record, winning in five of the last 8 years. Imported horses to win: Fraar (1993) Taufans Melody (1998) & All The Good (2008). Rising Fast (1954) is the only horse to win the Caulfield Cup, Cox Plate & Melbourne Cup in the same year. As well as holding the record for training the most Melbourne Cup winners (12), Bart Cummings has trained 7 winners of the Caulfield Cup including Viewed in 2009. 10 horses have carried the Number 1 saddlecoth to win, the last being Northerly in 2002. By Car: About 15 minutes from the Melbourne CBD via the Monash Freeway, parking is available on course. Melways reference 68 E1. By Train: Frankston, Dandenong, Cranbourne and Pakenham lines depart regularly from Flinders Street to Caulfield Station, located directly opposite the course. The journey from the City takes approximately 15 minutes. Additional services are provided during peak times. By Tram: The No. 3 from the City along Swanston Street. The journey takes approximately 25 minutes with racegoers alighting at Stop 52.